Summer is just about here and it’s time to spruce up your backyard! If you don’t have a pool or other large item taking up space on your lawn, a backyard can often seem like a big grassy void. However, activities like cooking healthy meals, exercising and enjoying being outside are great ways to use your outdoor space to it’s full potential. Lawn twister: warm up your muscles and bond with family and friends over this classic game of physical fun. Use spray paint to affix the twister board to your lawn and download a twister spinner app for free. Keeping materials simple and affordable assures that you will use it often and not lose any pieces. Compost pile: letting non-animal kitchen scraps and rotten produce decompose outside keeps excess waste out of our landfills and provides nutrient-rich soil to help fertilize plants around your home or garden. Compost piles benefit the earth and allow you to not waste excess food. Backyard beach: mimicking the beach by spreading bulk sand and dry ferns in a limited area of your backyard makes for a great place to read, tan, build sand castles or just relax. If you want to hang out in the sun though, be sure to wear sunscreen and protect yourself from damaging rays. Outdoor Scrabble: this traditional word game comes alive when it’s life sized and is great for time spent on a lawn or patio with family. If you’re feeling crafty, make your own set from repurposed stones, concrete and wood. Gain culinary prowess: grow your own herbs and fresh ingredients and then grill them together with lean meats and fish. 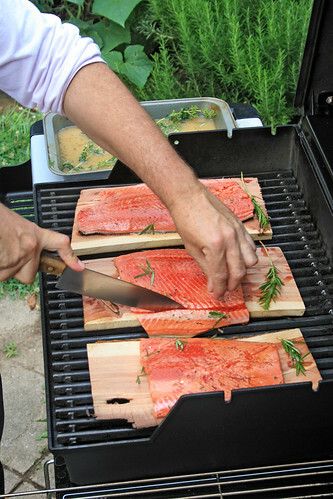 Cedar board salmon with fresh dill is a foodie favorite and a good place to start. Hit the gym outside: there are tons of DIY gym equipment hacks that are weatherproof and inexpensive. Think yoga routines on the lawn, PVC pipe dumbbells and sandbag strength trainers. How do you like to spend time in the backyard?